Me! On a ballot paper! Today’s excitement is due to the arrival of the ballot paper for the East of England Co-op election. 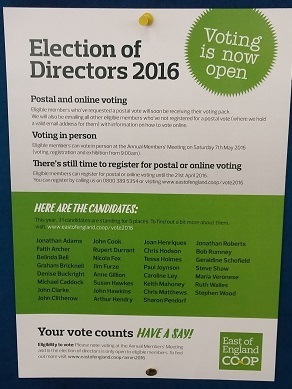 Well, it’s exciting for me, because I’m standing for election to become a director on the Co-op board. As are another 30 people, for a grand total of 5 spare places. So let’s just say my chances aren’t that great. 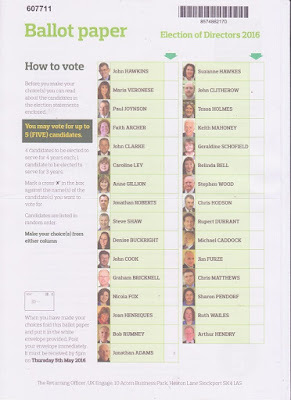 But if you have an East of England Co-op card, and might be willing to vote, that would be fabulous! I would love the chance to unite my passions for food and retailing, and help the Co-op remain a successful business at the centre of our local community, but we’ll just have to see how it all goes. For now, it feels really odd every time I nip into the Hadleigh Co-op and see my name on a poster on the noticeboard. The poster in the Co-op. I’m in there somewhere! Results will be announced at the East of England Co-op AGM in Wherstead on May 7th. Hope I have any nails left by then! You've reminded me that I need to change my address for my Co-op card! and I meant to say " Good Luck" and I hope you get 100s of votes.